"We Don't Go To Ravenholm"
Half-Life 2 was developed by Valve Software and was released on November 16, 2004 for Windows following a 5-year development cycle, and later on Steam and the Xbox. The game gained almost unanimous praise and acclaim for its story, fluidity and the gameplay in general. 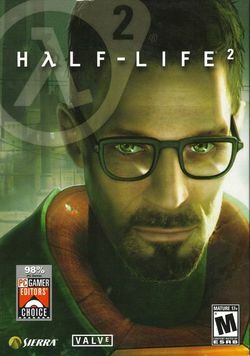 The game was bundled with Counter-Strike: Source, a remake of a critically-acclaimed total-conversion mod for the original Half-Life. Half-Life 2: Deathmatch was later released via Steam and was free to download for all owners of Half-Life 2. The full game was included in an updated form with The Orange Box compilation for Windows, Steam, Xbox 360 and the PlayStation 3. You are Dr. Gordon Freeman, theoretical physicist and one of the only survivors of the Black Mesa incident. Finding yourself on a train to who-knows-where, you are plunged into a world oppressed by an alien empire, a world fraught with dangers that you, a mere scientist, will have to overcome. This page was last edited on 16 August 2016, at 16:55. This page has been accessed 74,217 times.